The Three Sisters Lighthouses are located in Eastham on Cape Cod. In 1836, residents of Eastham wrote to the Boston Marine Society asking for a lighthouse on Nauset Light Beach on the Atlantic shore of the Cape, halfway between Highland Light in North Truro and the twin lights at Chatham. Many vessels had been wrecked on the Nauset Bars offshore. To distinguish the location from the single light in North Truro and the double lights at Chatham, it was determined that there would be three lighthouses at Nauset Beach. Winslow Lewis built the original 15-foot, triplet cone-shaped brick towers. The lighthouses, each 15 feet wide at the base and 9 feet wide at the lantern deck, were built in just 38 days. A small three room (plus 2 more in the attic)brick house, was also built. The lights were 150 feet apart from each other, arranged in a straight line. Each lantern held 10 lamps with 13.5 inch reflectors and emitted a fixed white light. The three towers were nicknamed, the "Three Sisters of Nauset." The name is said to have originated because the towers looked like three ladies in white dresses, wearing black hats. Nauset beach has always been considered a dangerous place for vessels, and many have been wrecked there, but the three lighthouses seems like overkill. Some people wondered why the government was wasting 3 times the resources when one distinguishable light would suffice. By the time of an 1850 inspection of the 3 Sisters, Joshua Crosby was keeper and the number of lamps in each tower had been reduced to six. In 1856, all three towers were fitted with sixth-order Fresnel lenses, replacing the old multiple lamps and reflectors. Nathan Gill's stint as keeper (1869­83) saw several major changes. In 1873, more powerful fourth-order Fresnel lenses were installed. An assistant keeper was authorized, and by 1876 a second wood-frame house was added to the station. Stephen Lewis followed Gill as principal keeper of the Three Sisters Lighthouses, remaining there until 1914. The three lighthouses poorly weathered many storms and were losing a battle with erosion. By 1890, the towers stood close to the edge of the cliff. If a three-light station was impractical in 1838, it was even more so in 1892. Nevertheless, three shingled wooden towers, 22 feet high, were built 30 feet west of the old towers in 1892. The lenses were transferred from the old towers to the new ones on April 25, 1892. A small brick oil house was added to the station at the same time. By 1911, the cliff had eroded to within eight feet of the northernmost tower, and the Bureau of Lighthouses finally decided to change Nauset to a single light. The Three Sisters Lighthouses were moved back from the edge of the bluff. The center tower was given a white light that flashed three times each 10 seconds (paying homage to the Three Sisters), and attached to the 1876 keeper's house. The original dwelling was removed. The single light went into service on June 1, 1911. The lighthouses were eventually incorporated into a summer cottage known as "The Towers" on Cable Road, not far from their original location. By 1923, the remaining Sister was in poor condition. Meanwhile, Chatham Light Station was changed from two lights to a single light. The discontinued twin from Chatham was dismantled, transported to Eastham and installed on a concrete foundation. 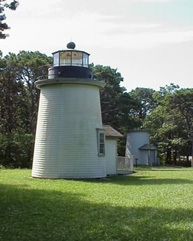 The new Nauset Light received the fourth-order Fresnel lens from the remaining tower of the Three Sisters and its flashing light was fueled by kerosene. The keeper's house was moved back from the edge of the cliff and placed near the new tower. The last of the Sisters fell into private hands and became a residence known as "The Beacon." This is an original footing from one of the Three Sisters Lighthouses. You can see it at low tide on Nauset Light Beach. Return To Cape Cod Lighthouses from Three Sisters Lighthouses page.